Real books making a comeback? Is the Kindle in trouble? 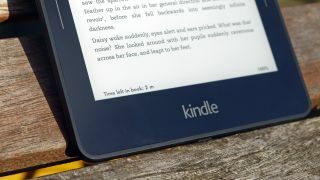 Head to Waterstones this week to pick up a nice new Kindle for yourself and you might come back disappointed: the bookselling chain is removing the device from many of its stores due to a lack of interest. "Sales of Kindles continue to be pitiful so we are taking the display space back in more and more shops," Waterstones MD James Daunt told the Bookseller. "It feels very much like the life of one of those inexplicable bestsellers; one day piles and piles, selling like fury; the next you count your blessings with every sale because it brings you closer to getting it off your shelves forever to make way for something new." Either no one's buying Kindles any more or no one's buying them from high street stores, but it's worth remembering that Kindles last a lot longer than smartphones and need replacing far less often. Physical books will be plugging the gaps on Waterstones shelves. Amazon has always been coy about releasing sales figures for the Kindle - or indeed any of its other hardware products - but the ereader has long been regarded as one of the company's biggest success stories. The newest version was launched earlier this year. Amazon is still "pleased with the positive momentum and growing distribution of Kindle and Fire tablet sales" according to a spokesperson, who also said Kindle ebook sales were growing across the world. "Our devices are now available in over 2,500 retail locations across the UK, including Argos, Tesco, Dixons, John Lewis and recent additions like Sainsbury's, Boots and Shop Direct." Just last month Amazon released a bunch of new tablets to try and kickstart its hardware division, but it appears that even its most dependable line of business could use a boost in sales. In the meantime, you're best off ordering that Kindle online.